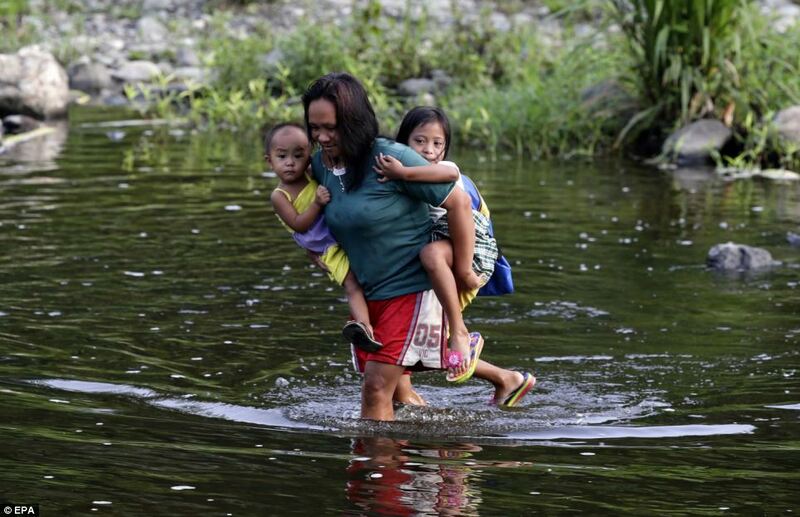 As almost 21million pupils in the Philippines trooped to school for the first day of term today, some had to go to more extreme lengths to get to class on time. 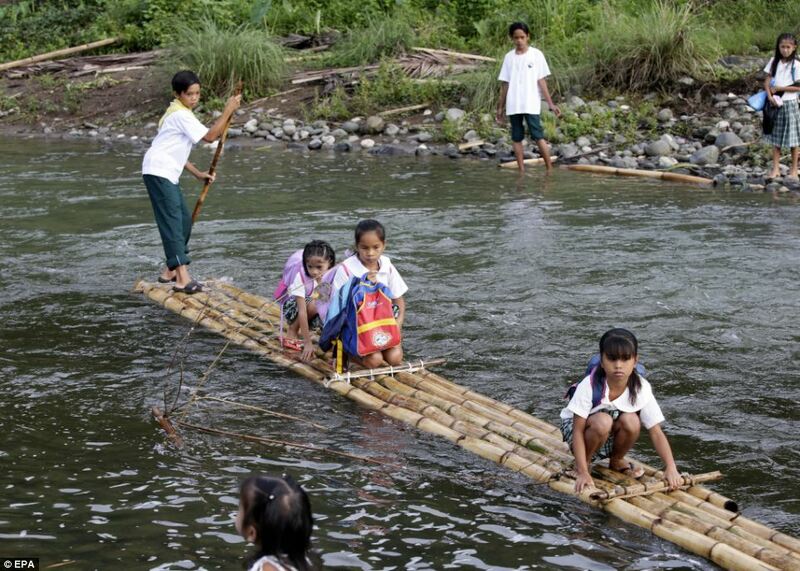 Filipino youngsters travelled on a bamboo raft to get to school in a remote village in Rizal province, east of Manila. 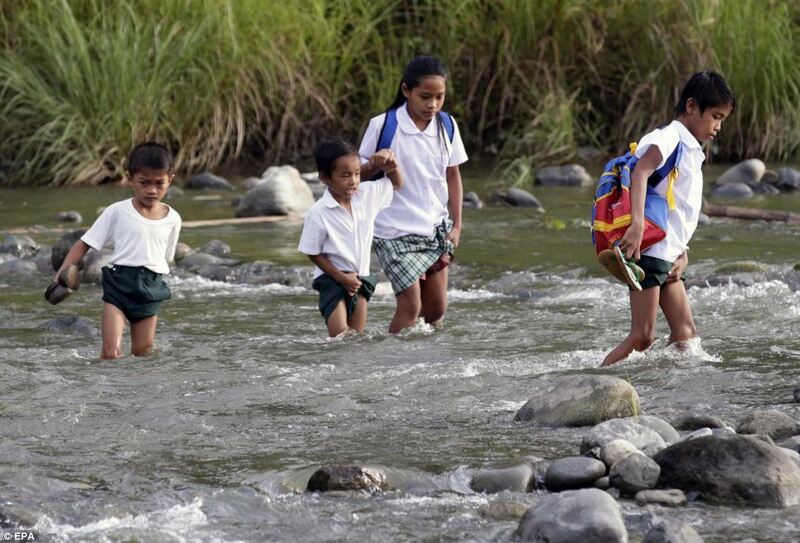 The students had to cross a river on route to school and they hitched a ride on the thin makeshift raft. 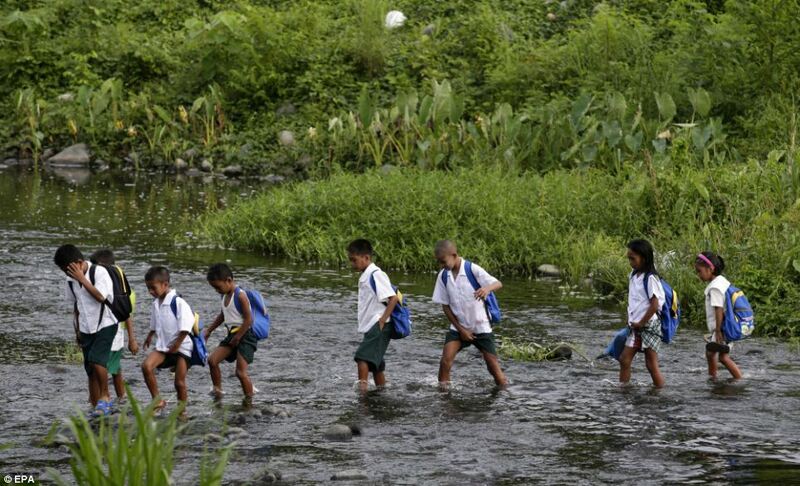 Children who were not so fortunate had to wade across rivers and streams while trying to keep their uniform dry. Elsewhere, entire families, including four children, squeezed on to motorbikes as they made their way to lessons. 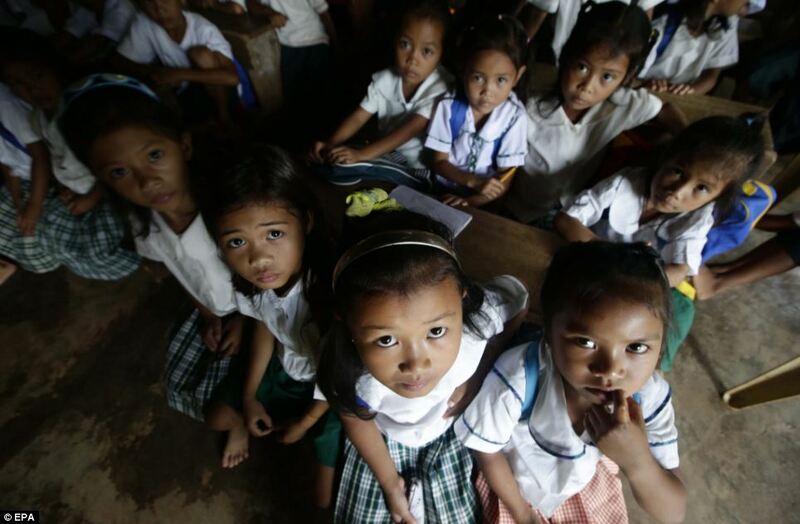 Across the Philippines, millions of children made their way to the country’s public kindergarten, elementary and high schools. 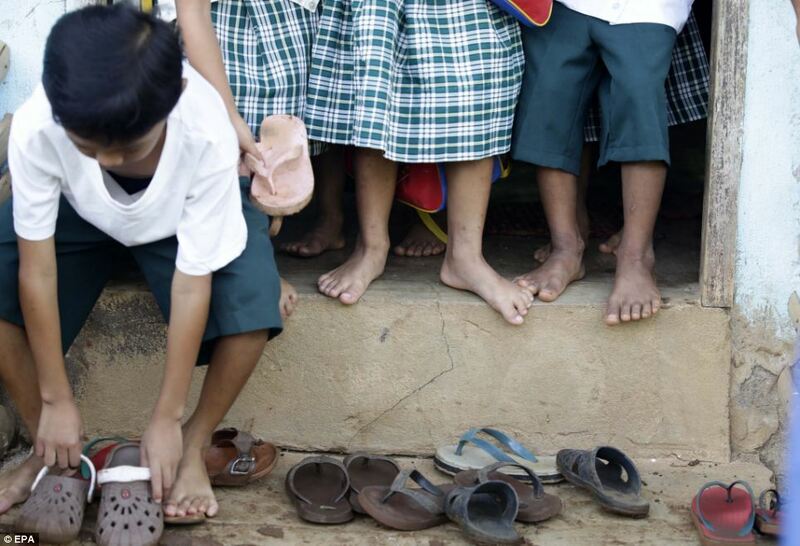 A further three million children are expected to start classes in the coming weeks, education officials said. 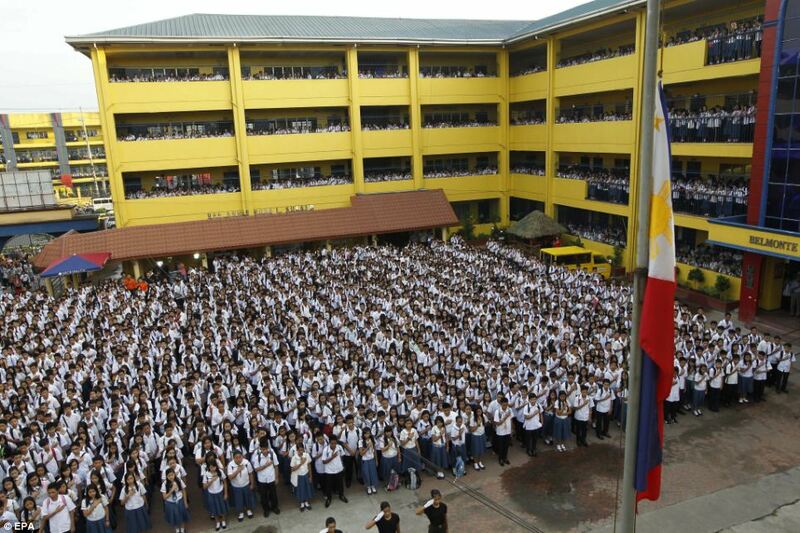 Pupils, dressed in school uniform, were pictured reciting the oath of allegiance at the start of the day. 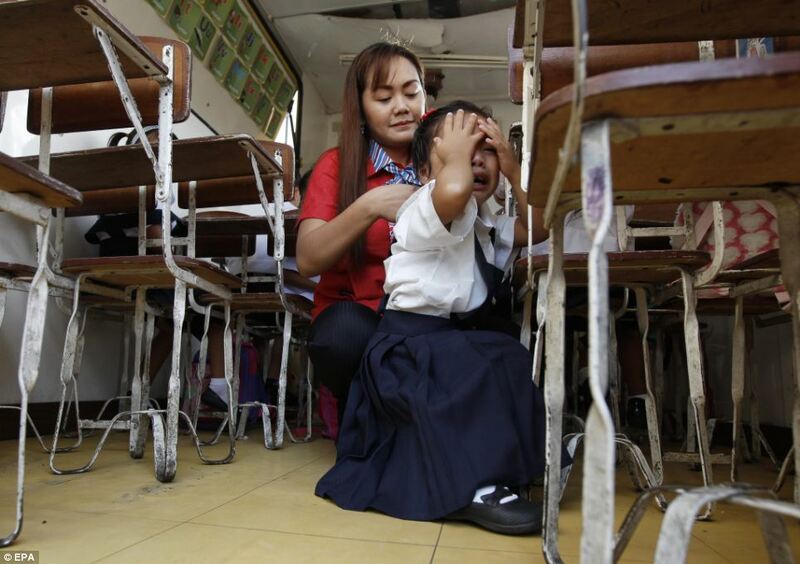 Thousands of police were also deployed to the country’s capital Manila amid security concerns and fears about children being snatched. 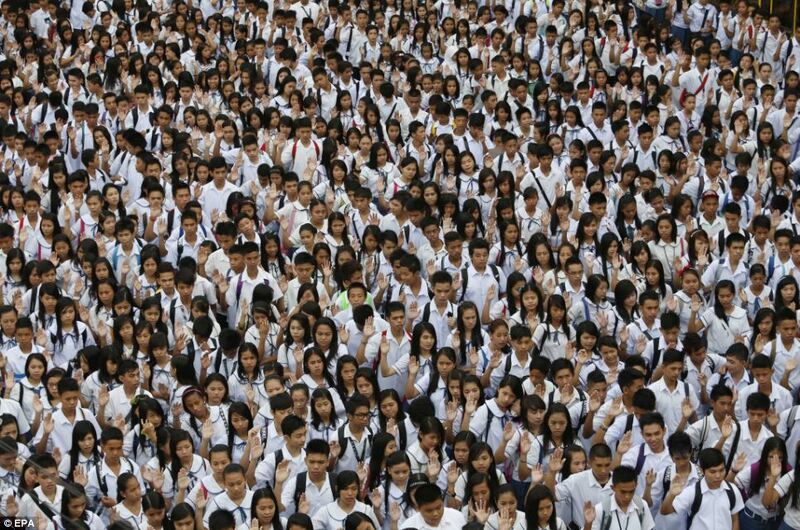 The 10,000 police were also needed to deal with the huge overcrowding as the millions of children made their way to class for the opening of the school year. 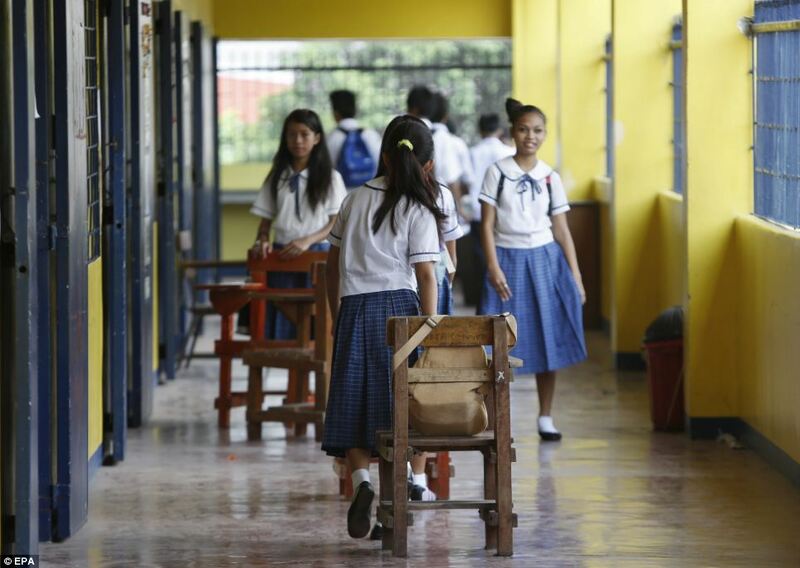 Local media reported overcrowding in many schools as 19,000 classrooms are still under construction. 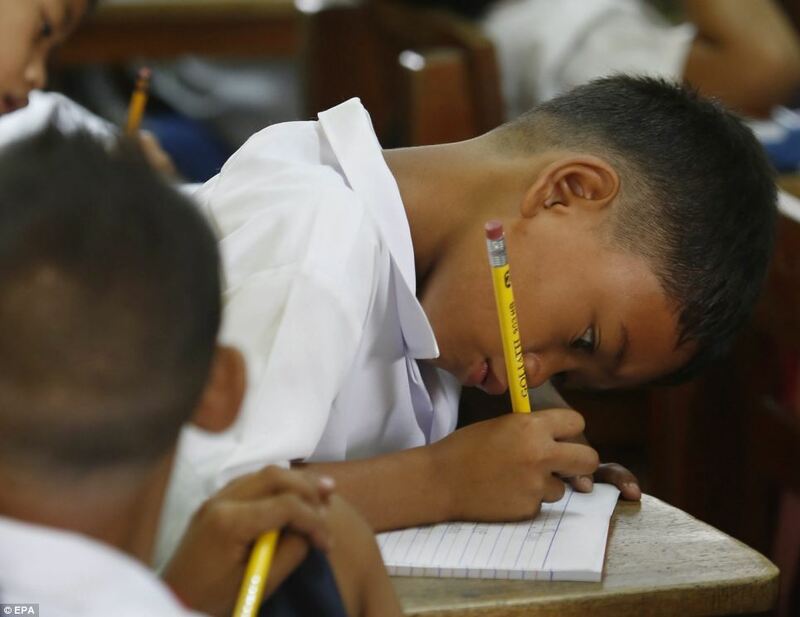 The Department of Education capital region director Luz Almeda told radio station dzBB that five per cent of schools in urban areas will have more than 55 students per class. Officials said the ideal number is 25 per kindergarten class, 45 for elementary and 50 to 55 for high school classes, according to ABS news. Such is the need for more schools in the country that teachers have to give lessons in shifts because of a lack of classrooms. The number of pupils enrolling this year has increased 1.45 per cent after the Government introduced a new law making kindergarten compulsory. 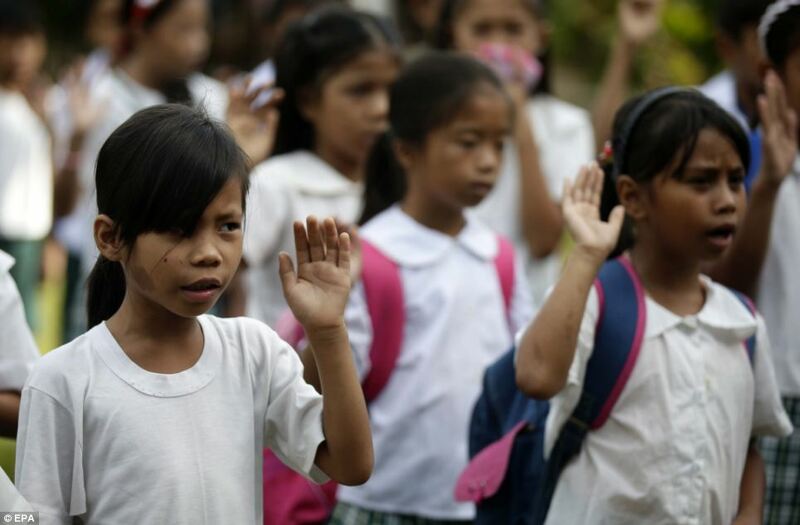 The law was part of the Philippines’ commitment to the global ‘Education for All’ programme, which was signed into law by President Benigno Aquino last month. The universal kindergarten scheme began being implemented in the country last year but facilities are still lacking in the country. More than 32,000 classrooms were built in the last three year but up to another 19,000 are needed. Some children pictured today did not have desks or even seats during lessons and had to sit on the floor. This is despite 1.2million new seats being provided and another 900,000 scheduled to be delivered by the end of the year. However, the historic programme has seen 35,000 new teachers hired since 2010. The Education for All programme gives access to education from the age of five at kindergarten where they learn the alphabet, numbers, shapes and colours. 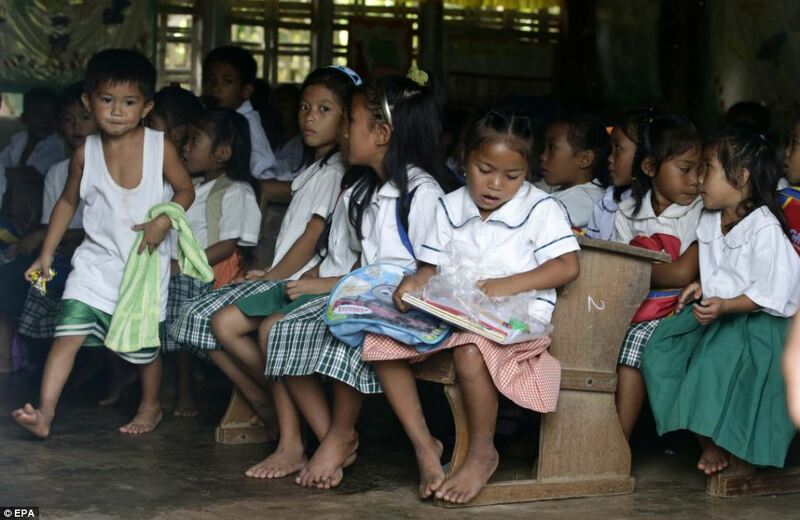 The K-12 adds two years of basic education with the aim of increasing students’ skills.